Anne Beaumont's practice focuses on representation of investment and asset management firms and their managers and investors as well as financial services firms in litigation matters and disputes involving complex financial products and transactions. She also counsels and trains financial services industry clients on legal compliance, due diligence, and other issues, and advises investment and asset managers and their professionals on employment and separation issues. 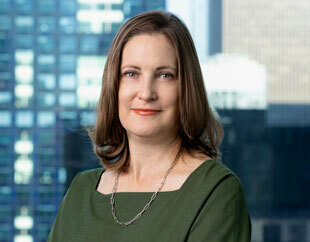 Ms. Beaumont leads the firm's LIBOR Transition Task Force, and also serves on the Management Committee. Representation of Wells Fargo Bank, N.A. in defense of a class action lawsuit alleging a conspiracy to set the ISDAfix benchmark rate. Representation of a CDO collateral manager and recovery service provider in litigation brought by a CDO trustee. Representation of an asset management firm in defense of intellectual property claims asserted by an index provider. Representation of GSO Capital Partners in litigation challenging its refinancing of debt issued by New Jersey-based home builder Hovnanian Enterprises, Inc. Representation of a hedge fund in defense of litigation brought by a redeemed investor in the fund. Representation of clients, including banks, investment funds and end-users, both in affirmative claims against the Lehman Brothers bankruptcy and SIPC estates and in defense of claims by the bankruptcy estate regarding derivatives transactions and prime brokerage accounts. Representation of a large group of institutional investors in Lancer Offshore, Inc. and The Omnifund, Ltd., following the funds’ demise, in litigation against the funds’ auditor, administrators, prime broker and directors. Representation of two municipal bond hedge funds in connection with litigation against their prime broker challenging margin calls that led to the funds' collapse. Prior to joining Friedman Kaplan, Ms. Beaumont practiced at Willkie Farr & Gallagher and Boies, Schiller & Flexner LLP. Ms. Beaumont is a member of the Managed Funds Association, 100 Women in Finance, and the SIFMA Legal & Compliance Society. She also serves as a Director, Chair of the Nominating and Membership Committees, and a member of the Executive Committee of Tall Ships America, which organizes the annual Tall Ships Challenge® Series of races, encourages character building through sail training, promotes sail training to the North American public, and supports education under sail. Does the Digital Realty Decision Represent a Sea Change for Whistleblowers or Merely More of the Same? 8-K Gap: Next Big Thing In Insider Trading Enforcement?